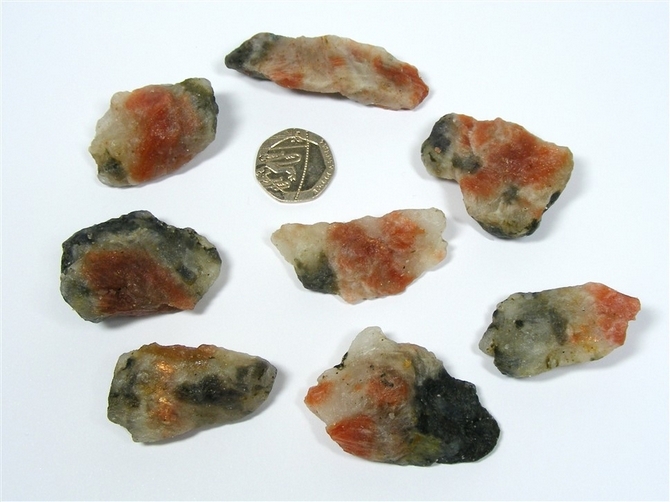 These wonderful pieces are naturally occurring Sunstone with Iolite from India. Quite hard to find as rough/natural stones and not seen for sale that often, these stones have a lovely blend of orange Sunstone with indigo blue Iolite. Sunstone with Iolite brings to us the properties of both stones and is excellent for helping us to combat depression and learning to enjoy the moment. Sunstone is good for general aches and pains. It helps to relieve tension around the stomach and is useful in cases of chronic sore throats. It is also useful for relieving ulcers. Sunstone is truly a crystal for helping us to feel good about ourselves. It increases our sense of self-worth, warms our hearts and lifts our spirits. It can help to balance our chakras and make us feel "fresh and clean". Sunstone helps to dispel fear, relieve stress and increases our vitality. It encourages independence and originality. Sunstone is an anti-depressant crystal and one that stops us feeling a failure. Sunstone is also supposed to bring us good luck when playing games. Sunstone represents the ancient Sun Gods bringing life and abundance to us. It provides us with clarity when we meditate. Iolite balances the Male and Female aspects of ones life and can help us to become more of a "whole person" or more "harmonious" as a result. It helps to rid the body of toxins, improve liver condition and lessen the formation of fatty deposits. It has been used to treat malaria and other fevers. Iolite is a stone that will help you to "enjoy the moment" and to release discord from your life. It increases the levels of your imagination and helps to develop your intuitive creativity. It can draw on your subconscious mind and assist you in perceiving the truth of a situation. Iolite also helps you to accept your responsibilities in life. Iolite is an extremely powerful meditative and healing stone. It has long been used on the Third Eye Chakra point to assist during guided meditations and for undergoing astral travel experiences. In Shamanic healing it has been used to influence the spirits. Iolite is also said to stimulate visions.